I know that the mitochondria is basically the power house of the body, it consumes amino acids, fatty acids, glucose, etc and oxygen. When these molecules meet up in a enzyme, a series of reactions happen (Krebs cicle) which end up in CO2, H20 and energy. Then the enzyme and later mitochondria will release its energy which will be stored in ATP molecules. My question is what is this energy? ATP is used in a variety of cellular processes, from signal transduction to biosynthetic reactions, motility, and cell division. An interesting bonus fact: an adult human body only contains about 250 grams of ATP at any one time, but turns over its entire body weight in ATP during the course of a single day. The use of the energy in ATP is quite complex. Since my college days our knowledge of how ATP is used has broadened considerably. Let's look first at the role of ATP in the sodium-potassium pump. This pump uses roughly 20% of the ATP your body produces, even more if you are a couch potato. ATP powers this process by attaching its terminal phosphate group to the pump. The phosphate group is highly charged. Its attachment pulls and tugs on some regions of the pump and repels other regions due to the fact that many of the amino acids comprising the pump are polar or charged. These electrical, magnetic-like, interactions change the shape of the pump. This causes sodium ions to be pumped outside the cell even though they are more plentiful there. When the phosphate is released, the pump returns to its original shape bringing in potassium ions and reloading sodium. It is this pumping action that, among other things, provides the energy for messages in nerve and muscle cells (action potentials). Probably the important energy use of ATP is this. Many of the reactions your body needs are uphill battles. That is, there is more energy in the substances we wish to produce (products) than in the substances which we must use for raw materials (reactants). So, the ATP attaches its phosphate to the reactant. This raises the energy in the reactant making it now have more energy (more unstable) than the product we wish to produce. The reaction now becomes "downhill" and can proceed naturally ("spontaneously") without holding a bunsen burner under your bottom. 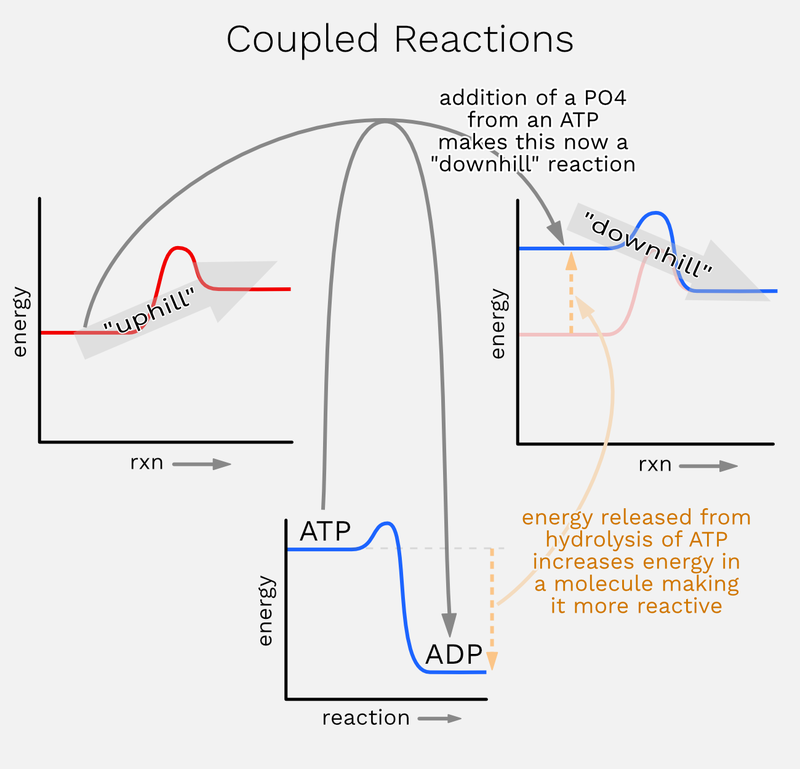 This concept is termed "coupled reactions" where we take the "downhill" breaking down of ATP and use it to power the "uphill" production of a requires substance. There are two principal reasons a molecule becomes more energetic when a phosphate is attached. It is now more complex. Complexity increases instability, a consequence of the laws of thermodynamics. Another reason is that the highly charged phosphate creates stress in the molecule due to electrical interactions with other parts of the molecule. You seem to have misunderstood energy as some sort of substance which is produced as a product of cellular respiration like CO2 or H2O then released into the bonds of ATP molecules. Remembering that it is not a substance and that it is transferred(and not made) by the breaking and formation of bonds in the process of respiration should help clear that out.